Parker, Colorado—February 13, 2017—The Solomon Foundation (TSF), a church extension fund serving the Christian churches and churches of Christ with headquarters in Parker, Colorado, has acquired Christian Standard Media, according to TSF chief executive officer Doug Crozier. Christian Standard Media consists of The Lookout and Christian Standard magazines. “We’re delighted by this opportunity to grow in our service to the churches,” said Mark A. Taylor, publisher. Crozier stressed that the magazines will operate as an independent, nonprofit ministry, Restoration Movement Media, a Colorado nonprofit corporation continuing to serve as many congregations, ministries, and Christian leaders as possible. While the magazines’ business will be conducted from the Colorado office, the editorial staff will continue to operate from Cincinnati, Ohio. Taylor is editor of Christian Standard, and Kelly Carr is The Lookout editor. Christian Standard was founded in 1866 by Isaac Errett whose family owned the magazine, which grew into Standard Publishing. The Lookout began publication in 1894. The Errett heirs sold the business to a Christian businessman in 1955, and it became the cornerstone of a multinational corporation finally known as Standex International. 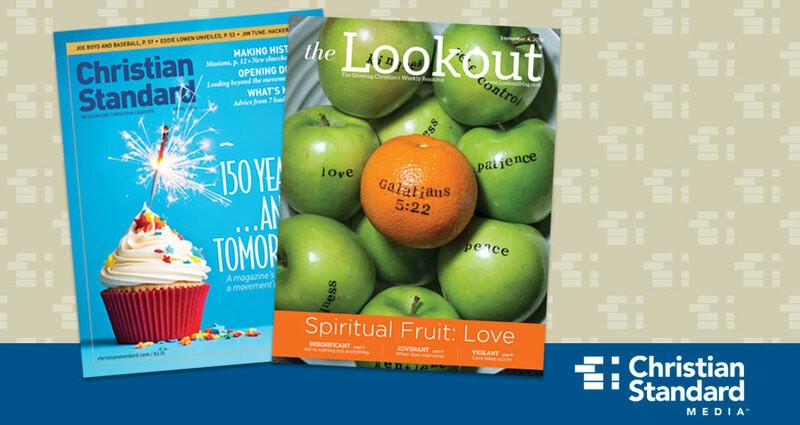 Christian Standard Media will continue to serve readers through the two print magazines, their three websites christianstandard.com, lookoutmag.com, and christianstandardmedia.com, as well Christian Standard’s digital editions, available through a widely distributed app for phone or tablet. The Solomon Foundation is one of the fastest growing church extension funds in America. When you invest with us, you not only get excellent rates but you make an eternal impact by providing funding for expansion and growth of the Independent Christian Churches and Churches of Christ. For more information, visit thesolomonfoundation.org or call 855.873.5873. Christian Standard Media is committed to continuing its 150-year tradition as a Christian mission-driven leader in providing resources for the church, beginning with Christian Standard magazine, published since 1866 with a devotion to New Testament Christianity. The Lookout magazine has followed in this tradition since 1894. For more information, visit ChristianStandardMedia.com, ChristianStandard.com, LookoutMag.com or call 800.543.1353.